The greatest quilt I have made to date! Oh how I love it, my precious Macaroni Love Story in the perfect pattern. Measuring at 40"x40" it perfectly showcases the great Heather Ross fabrics. Now I just have to decide on the perfect way to quilt it! What was wee man doing? Watching the quilt and mommy! Wow Marci, I LOVE it!!! I'm having a really hard time trying to figure out which of the quilts I love the best, you all did such an amazing job. Yours turned out just perfect! And I have to say, what a great feeling you have given me to say that this is your greatest quilt you have made to date. Seriously, goosebumps here. I think you have totally just made my week with that comment alone! Thank you so much for joining us! It IS wonderful - good for you, Marci!! Marci, it is just so perfect! Excellent job, lady. And look how big your little man is getting! Holy crapola, you pulled that together FAST! I absolutely love love love this combo, Marci - and I really love what you did with the lighter fabrics to form that sorta crowning ring around the center. Oh, my! That is fabulous! Oh having trouble picking which I like better, the adorable baby or the quilt. Hehe :). Great job on the new quilt top - the pattern is stunning! It looks fab, well done! 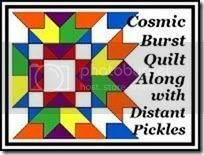 It really is a very wonderful quilt! And the baby is so cute too! Wonderful! I love the color palette.